Posted by Lorea Thomson on Thursday, September 25th, 2014 at 1:21pm. Mark your calendars for October 19, 2014 from 4:30 pm to 7:30 pm at the Meyer Amphitheatre on Flagler Drive in West Palm Beach. Sunday on the Waterfront is a FREE event organized by the city of West Palm Beach that takes place once a month. This outdoor experience is sure to please with pleasant autumn weather. Bring a lawn chair, cozy blanket and a picnic basket. Sprawl out on the lawn across from the waterfront, kick back and relax to the sound of music. 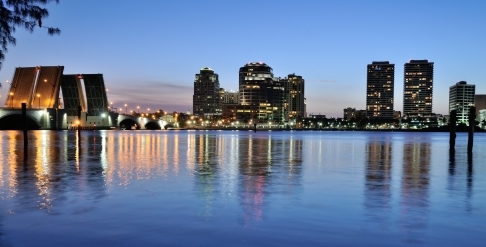 Downtown West Palm Beach is one of the larger cities in Palm Beach County. It offers a metropolitan feel along the six miles of Flagler Drive with city life and residential options with plenty of galleries, museums, restaurants, shopping and more things to do. Walk to Clematis Street after “Sunday on the Waterfront” and visit the busiest street in the city. Clematis Street offers an extended dining, bar, and nightclub life open nearly every day of the week.